Listeria monocytogenes. Photo via CNN. (CNN) More than 21,000 pounds of frozen pizzas are being recalled due to possible listeria contamination, the US Department of Agriculture’s Food Safety and Inspection Service announced Wednesday. RBR Meat Company Inc. recalled its Marketside supreme frozen pizza, which may have been “adulterated with Listeria monocytogenes,” according to FSIS. The pizzas were sold at select Walmart stores in a 50.6-oz. box containing single shrink-wrapped 16-inch pizzas labeled as “Marketside Extra Large Supreme Pizza,” with lot code 20547. 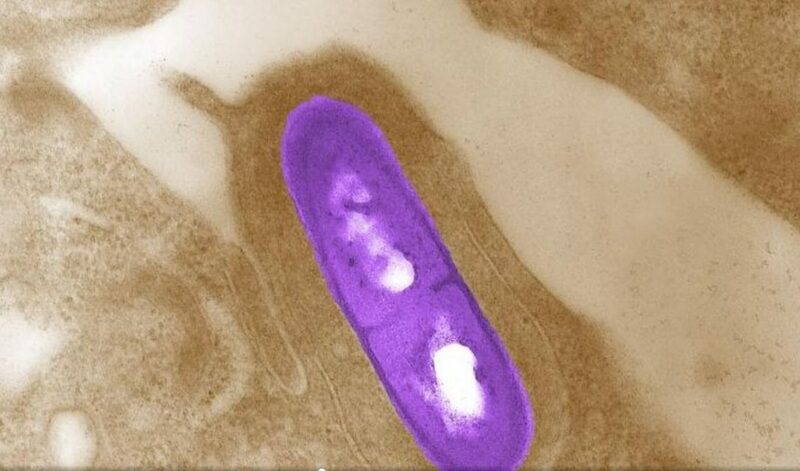 During routine sampling, FSIS discovered the Listeria monocytogenes bacteria. “There are no confirmed reports of adverse reactions from consumption of the pizzas at this time,” according to the recall announcement. This recall is a Class I recall, which means it is “a health hazard situation where there is a reasonable probability that the use of the product will cause serious, adverse health consequences or death,” according to the USDA. FSIS urges consumers who have bought the product to not eat it. They advise throwing away the pizzas or returning them to the place of purchase. The pizzas were shipped to Walmart distribution centers in California, Nevada, Utah and Washington. Listeriosis is a serious infection usually caused by eating contaminated food and can be particularly dangerous for pregnant women and older people. Symptoms include fever, muscle aches and sometimes diarrhea or other gastrointestinal problems, according to the US Centers for Disease Control and Prevention. About 1,600 cases are reported in the United States every year, with 260 resulting in death, according to the CDC. Last week federal health officials announced an unrelated recall of soft raw milk cheese made by Vulto Creamery due to a listeria outbreak responsible for six cases of illness including two deaths. Last month Sargento Foods announced its own recall of several cheeses due to potential listeria contamination, which prompted the company to cut ties with one of its suppliers.